Funeral at Har Herzl for 21-year-old Weissman, father of 4-month old, who was murdered by terrorists while trying to defend fellow shoppers. 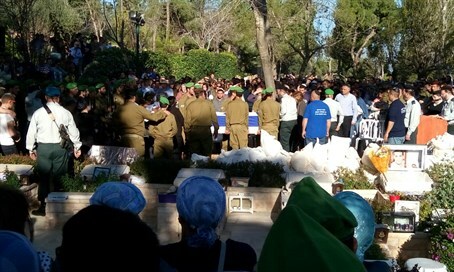 The funeral of Staff Sergeant Tuvia Yanai Weissman, the 21-year-old combat soldier of the Nahal Brigade who was murdered while shopping by knife-wielding 14-year-old Arab terrorists on Thursday, began at 8 a.m. on Friday at Har Herzl military cemetery in Jerusalem. While shopping for Shabbat at a Rami Levy supermarket in Sha'ar Binyamin northeast of the capital, the young father of a four-month old baby girl was stabbed by the terrorists from nearby Bitunia. He was critically wounded and succumbed to his injuries after being evacuated to Shaare Tzedek Hospital. In the attack a 36-year-old man later identified as Avi Avital was also stabbed and moderately wounded; he remains under treatment at Hadassah Mount Scopus Hospital. Weissman was a combat soldier in the Nahal Brigade and grew up in Ma'ale Mikhmas in the Binyamin region of Samaria. He studied at a high school in Jerusalem and at a pre-military academy in Kfar Eldad in Judea. He enlisted in the Nahal Brigade and got married during his military service. Weissman leaves behind his wife Yael, a four-month-old daughter, his parents and three brothers. At the funeral on Friday, Weissman's father Dana eulogized his son, saying, "you loved your daughter Neta so much. You took her to see the flowers in the Negev a day before you were murdered. No hatred and no enemy will end that (love)." His mother Orli said, "I release you to God, but I don't know if I'll be able to release the love. You were very independent and went on your path." "You ran and I waited for you"
Weissman's bereaved widow Yael said, "you were always full of endless giving, if you hadn't run there (to stop the terrorists) you wouldn't be the Yanai that I know and fell in love with. If only you could have been with Neta more, how many dreams we had." "Before we entered the supermarket I asked you when we will be a normal family and you said it won't be long," she said, in a reference to his ongoing intense army service. "My beloved, who would believe that I would write to you while you are no longer with me, in the short time we had on the weekends you made sure to take care of everything. You heard that something happened and you ran and I waited for you." "We managed so much in two years of marriage even though we weren't together a lot." "Yanai you are a true hero of all the nation of Israel, you knew that you had no weapon and nevertheless you ran. I want to thank you, I merited to learn from a talented and special man. Thank you for our Neta," concluded Yael. "You fought with your heart"
Rabbi Shmuel Natanzon of the Yedidya academy where Weissman studied eulogized him, saying, "Yanai with his great conquering smile, Yanai of uncompromising truth, Yanai of Yael, father of Neta, Yanai of his family and friends. Since last night Yanai of all the people of Israel. How much light you had, our beloved Yanai, how much light you knew to give to others." "We had many debates until the small hours of the night because you were a man of truth. You had doubts as to whether to go to (a) command (role) or continue in combat, I knew that you could be a role model and symbol. How proud you were of your wife Yael, of Neta, how many pictures you sent us of you and the children." "Yael told me yesterday that you were in a different aisle, you heard the shouts, she bent over Neta (to protect her) and you disappeared. You couldn't hear shouts and just stand there, that's how you were, you didn't have a weapon...you fought with your hands, with your body, with your whole heart," said the rabbi. Security cameras at the Sha'ar Binyamin shopping center revealed the terrorists being stopped for questioning by a security guard at the entrance to the center. After roughly a minute-and-a-half of questioning they were let in - with the lethal knives hidden on their bodies. Other footage revealed the two walking freely in the Rami Levy store for a full 20 minutes as they hunted for victims before attacking. After stabbing their two victims, the terrorists were shot by two armed civilians in the store, and then brought in for treatment at Hadassah Mount Scopus Hospital. Following the attack, the IDF decided to close the Sha'ar Binyamin Industrial Zone to Arab entry, aside from employees with work permits at the site. It was also decided that a route connecting Al-Ram and Adam will be closed to Arab traffic, and that security checks on Arabs coming out from the Ramallah region will be intensified.